Two Australian men have been jailed for the sexual assault of a woman who later died from her injuries. Adrian Attwater and Paul Maris attacked Attwater's partner, Lynette Daly, during a camping trip on a New South Wales beach in 2011. The case drew attention for the length of time it took to prosecute the men. State prosecutors have apologised for the delay. It also highlighted issues of how race is dealt with in prosecutions. The court determined that Attwater had performed a violent sexual act on Ms Daly that caused her serious injuries while she was too intoxicated to consent. 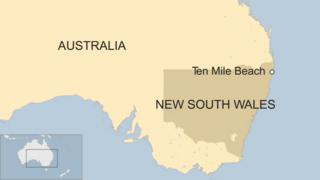 The attack took place on a campsite near the remote Ten Mile Beach in northern New South Wales. An ambulance was called hours later, but by the time it arrived Ms Daly had bled to death. The two men were found to have tried to wash away her blood in the sea and burn her clothes and a mattress. On Friday, Attwater was sentenced to 14 years in prison for manslaughter and aggravated sexual assault, while Maris received nine years for aggravated sexual assault and hindering the discovery of evidence. Though the men were initially charged in 2011, those charges were later dropped, with prosecutors saying they had insufficient evidence. Following a public outcry, the men were charged again last year. New South Wales director of public prosecutions Lloyd Babb issued an apology on Friday saying he "sincerely regretted" the delay. Ms Daley's stepfather, Gordon Davis, told ABC News: "The DPP has a lot to learn about Aboriginality and Aboriginals. You just can't sweep everything under the carpet, the way it was dealt with. "If it was two Aboriginal boys and they had done that to a non-indigenous person, they would've been in jail ages ago, and that's the difference."